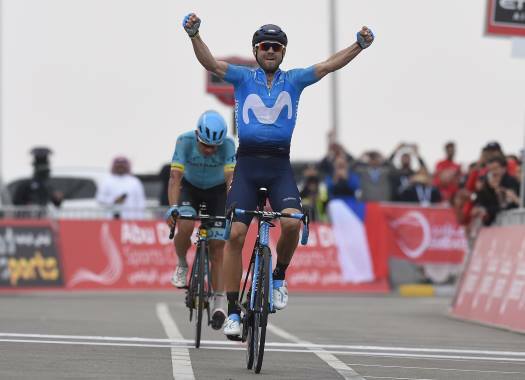 Movistar's Alejandro Valverde has taken the victory at the eighth stage of the Vuelta a España, showing once more his good shape. The final metres of the stage had an inclination that made it a difficult sprint for the specialists, but Valverde showed to have good legs for this kind of terrain. "To be honest I'm surprised," he mentioned. "They told me that the finish was going to be very hard and that we could even lose time. My Sports Director told me 'stay at the wheel of the guy that overtook you yesterday' and I told him that I wasn't planning to fight for the stage victory, that I was going to focus on avoiding time loses. "And then I stayed at the wheel of (Peter) Sagan, I could hold on to his wheel and overtook him at the last moment. I know I'm in good shape but this surprises me." At the first week of the Spanish grand tour, Movistar has two men in the top 10 of the General Classification and two stage victories. "I think we are going very well. We have taken two stage victories so far in the race. Everything is going well. It is true that there is still a lot to go but we can't complain. "Tomorrow we face the mountains, the real mountains. Tomorrow it will be evident who can be on the final podium of the Vuelta. Tomorrow will be the real test of this part of the race."